When we are mindful, we are deeply in touch with the present moment, our understanding of what is going on deepens and we begin to be filled with acceptance, joy, peace and love. The past is gone. The future is not yet here. And if we do not go back to ourselves in the present moment, we cannot be in touch with Life. To be beautiful, means to be yourself. You don't need to be accepted by others. You need to accept yourself. The source of love is deep in us and we can help others realize a lot of happiness. One word, one action, one thought can reduce another persons suffering and bring that person joy. Many people think excitement is happiness...But when you are excited you are not peaceful. True happiness is based on peace. New Updates! (4/25/2019) We've been working really hard on completing our membership system so you can submit quotes and keep track of them. Once this is complete in the coming weeks there will be a lot more quotes by Thich Nhat Hanh and other authors. 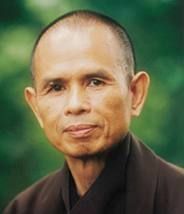 We've also changed the sorting on the site so you now see the latest Thich Nhat Hanh quotes first. Our goal is to have the best Thich Nhat Hanh quotes on the web!